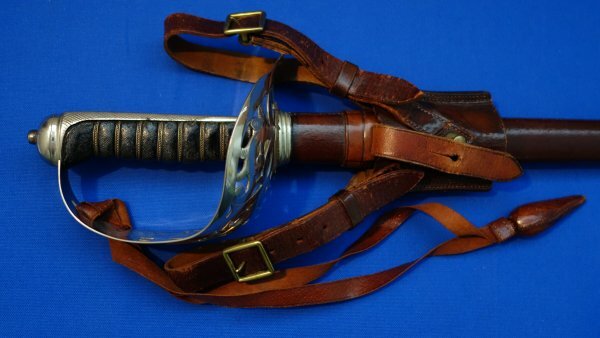 In very good (refurbished) condition, the Boer War Wilkinson British infantry officer's sword of Captain M. F. Halford (later Lieutenant Colonel) of the York & Lancs Regiment. Serial number 33489 (1895), confirmed on the Wilkinson sales ledger as having been sold to M. F. Halford of the 1st battalion of the York & Lancs Regiment, also with his initials "M F H" etched to the blade, Captain M. F. Halford served extensively in the Boer War, and later in World War One (details of his actions further below). 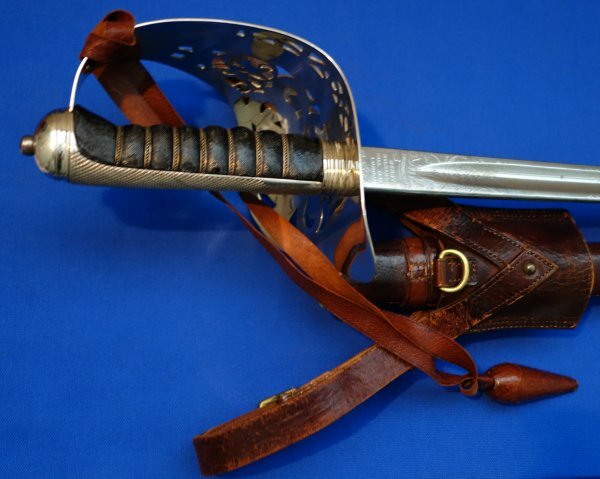 The 32 1/8 inch blade is in very good condition; the sword has been refurbished and replated, but very professionally so, perhaps period at Wilkinsons by M. F. Halford himself (the sword was likely blackened for use in the Boer War and he well may have wanted it restored to dress condition afterwards). Blade firm in hilt. 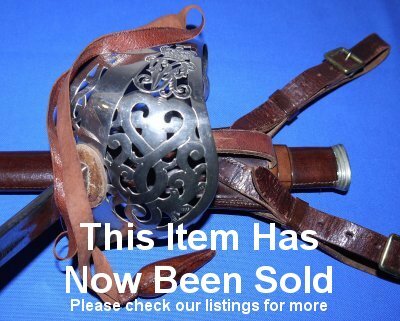 The hilt / guard very good. The grip with some wear but still good, the grip wire bindings also. The leather of the scabbard and frog, etc. are good, but some signs of wear, and not a bad thing. The sword sheathes and draws well. A really superb sword (bear in mind this is an 1895 pattern, not the more common 1897 pattern) with full provenance for a very important officer, yours for just £???. Please quote item reference L45 (1201). Further / full sized images available upon request. Lt. Col.M.F. Halford of York & Lancs Regiment, fought in the South African war 1899-1902. He served as Adjt 1 Bn York & Lancs regiment, 3Jan - 4Feb 1900 and 3 June 1901 - 31 May 1902, Relief of Ladysmith, including operations of 17th- 24th Jan 1900 (wounded 20th Jan) and action at Spion Kop; operations on Tugela Heights (14th-27th Feb 1900) and actions at Pieters Hill. Operations in Natal (March - June 1900) including action at Laings Nek (6th-9th June). Operations in the Transvaal, May to Aug 1901. Operations in Orange River Colony, Dec 1901-31May 1902. Despatches Lond Gaz 8Feb 1901 (Sir R.H.Buller, 30Mar and 9 Nov 1900) and Lond Gaz 10 Sept 1901 Brev of Major Queen's Medal with six clasps. Kings Medal with two clasps. The war of 1914-19 OBE.